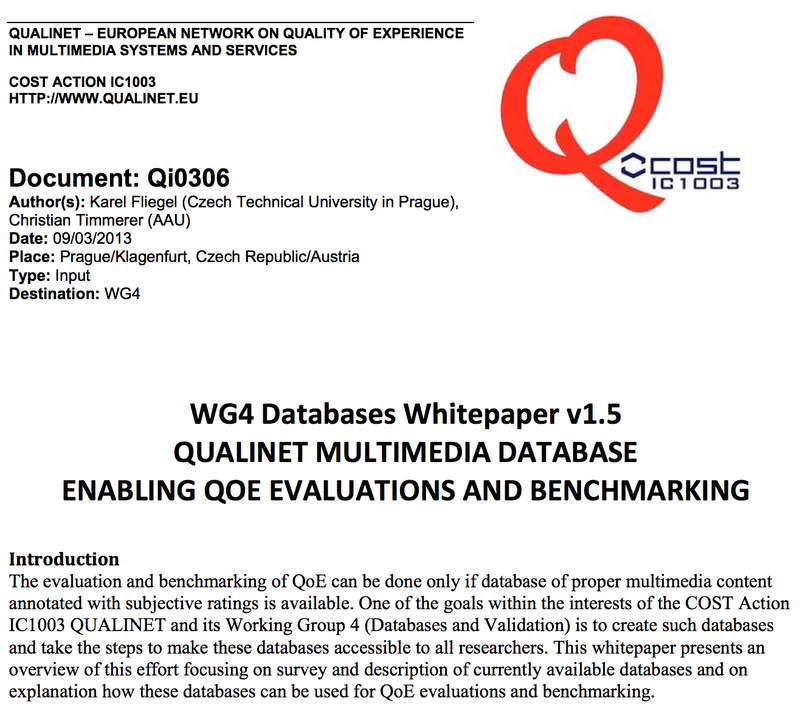 Currently, the QUALINET database comprises > 170 multimedia databases, based on literature/Internet search and input from QUALINET partner laboratories. They're mostly image (~52) or video datasets (~68), with (~57) or w/o subjective quality rating, special content, e.g. 3D (~23), FV, eyetracking (~21), audio, audiovisual (~8), HDR (~14), and other modalities. Karel Fliegel, Christian Timmerer, (eds. 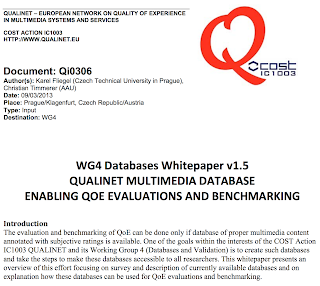 ), “WG4 Databases White Paper v1.5: QUALINET Multimedia Database enabling QoE Evaluations and Benchmarking”, Prague/Klagenfurt, Czech Republic/Austria, Version 1.5, March 2013. Finally, you're welcome to contribute to this effort, simply send an email to wg4.qualinet@listes.epfl.ch and briefly describe your dataset [to subscribe, send an e-mail (its content is unimportant) to wg4.qualinet-subscribe@listes.epfl.ch, you will receive information to confirm your subscription, and upon the acceptance of the moderator will be included in the mailing-list]. Additionally, you may consider submitting a dataset paper to QoMEX or MMSys which hosts dataset tracks and accepted dataset paper will be automatically included within the QUALINET database.